I do have a color temperature meter. I’ve had it for years and keep it in my camera bag all the time. It’s not foolproof though. It’s really good for pointing me in the right direction, but I find it’s not all that good at nailing down the exact color of the light. I use it to get me close and then I use good-old trial and error to get me to where I want to be. The great thing about digital photography is that you can see what you’re doing, as you do it. Lets talk about mixing colors. 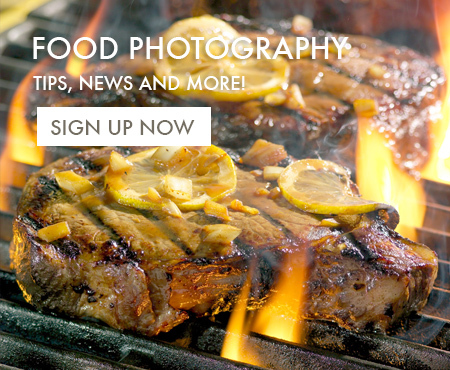 I shoot food almost exclusively with strobe light. I have recently purchased some LED lights for video, but I still shoot my food photography with strobes. As you know, strobe is balanced for “daylight”, and usually comes close to marching the color of the outdoor light. I say close, because the actual color of daylight, out doors, is constantly changing with the time of day, the amount of cloud cover, and a bunch of other factors. Choice #3 – My preferred solution for mixing light is to match my strobe to the ambient light. To match with tungsten lighting, this normally requires CTO filters to put over the lamp head. To match fluorescent lights, I add green filters to my strobe. When matching tungsten lights, I usually find it to be a good idea not to totally match the light, but to make my strobes a little bluer than the ambient light. And when I color balance my camera to the strobes, the ambient light in the background. and the fill light, ends up being a little “warmer” by comparison. That warmth usually adds a little “mood” to the shot, but if I didn’t get the lighting close, the warmth would probably be objectionably warm. The colour temperature meter is a good starting point but shooting digitally using a grey card for white balance makes getting the “correct” colour temperature for the light more of a breeze. It is only using different manufacturers light shapers that shows up the problem in the studio.